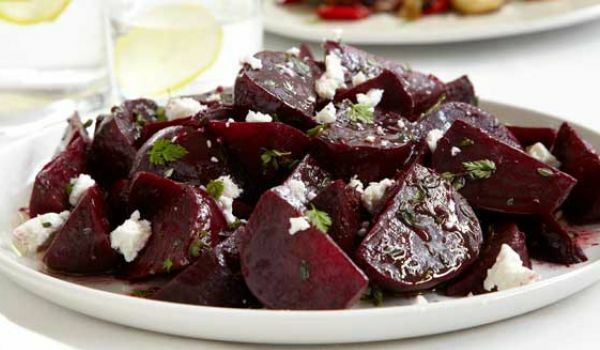 Beetroot Salad is an excellent sweet and sour salad, full of iron and vitamin A. Learn how to make/prepare Beetroot Salad by following this easy recipe. Grate the beetroot into thin juliennes. Take a pan and heat oil in it. Add mustard seeds to it when hot enough. When they begin to crackle, add the urad dal and asafoetida. Wash the curry leaves and add them when the urad dal turns red to brown in colour, followed by green chilies, but make sure no to let the chilies fry all the way. The chilies should be half done so that they lose their pungency. To this tempering, add the grated beetroot, the salt and the chopped coriander and toss on high flame for a few seconds, till the beetroot becomes crisp. Remove from the stove and transfer into a serving bowl. Add the lemon juice and toss once again to mix the flavour.